The list of artists we’ve met thus far on Freedom Records is rather unimpressive from a standpoint of purely commercial returns, something which undoubtedly has a lot to do with why the label is all but forgotten in the annals of rock ‘n’ roll. But from an aesthetic perspective and when examining the long tentacles of influence within rock Freedom Records is starting to loom as large as any company you can name, not just in the present landscape of 1949, but in comparison to any of the more storied labels from around the corner as well. For all those Sun Records devotees who preach to the heavens about that label’s impressive legacy which they insist can’t be properly explained through their scant chart history, I offer you the equally credible case of this Houston based imprint which arguably set even more rock precedents than the acclaimed Sun label in far less time in business AND they did it years before Sam Phillips even opened shop. Here we have the artistic blossoming of yet another Freedom Records artist who has been lost to historical indifference but on this side anyway L. C. Williams already sounds a half dozen years ahead of his time… which would’ve meant he’d have fit right in at 706 Union Avenue in Memphis circa 1955. Heading into release number three for former country bluesman L. C. Williams – we can’t say that at 19 years old he’s a “veteran” country bluesman, even though he’s already released eight songs in that style over four releases the past year and a half (and sounded as if he were already a senior citizen) – we weren’t sure he’d still be around, let alone a threat to break out with his best record yet. A lot of factors contributed to this uncertainty, if not downright skepticism, about his chances at sticking in the rock field. One of course was his aforementioned history as a country blues disciple of Lightnin’ Hopkins – not yet a huge seller in his own right, but certainly fairly well known around their Texas home base. 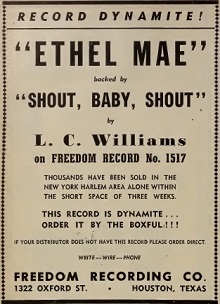 Since the blues had a much longer and more consistent track record among black record buyers than rock ‘n’ roll, even though rock was the larger selling genre the past year, especially compared to acoustic blues (as opposed to urban electric blues which was starting to do quite well in its own right), there was every reason to believe that Freedom Records might just tell Williams to shelve his rock aspirations and go back to the blues he’d proven fairly proficient at. Another factor is Williams wasn’t a sure bet to stay with the company. For starters he hadn’t yet been credited as the lead artist on his two releases (Freedom Records’ house band, The Hep-Cats, operating under the name Conney’s Combo, got the nod on both, with Vocals credited to Williams). Secondly his mentor Hopkins was notorious for label-jumping and taking cash up front for every session, thereby maintaining his freedom (no pun intended). Thus you had to assume Williams might be prone to doing the same. Add to the fact that neither of his first two efforts had been hits and maybe Freedom Records themselves wouldn’t want him back in the fold. So at first glance it’s great to see that not only has Williams returned for another shot, but that’s finally being credited as the lead artist. It’s just that when you turn the record over you lose some of your enthusiasm if you’re a rock fan, as the company hedged their bets and issued a cover of an Arthur “Big Boy” Crudup blues song called Ethel Mae on the flip side. That it’s done in a slightly more uptown fashion with a horn section behind him than his country blues offerings elsewhere is little consolation. What’s worse for OUR interests is the fact that this was the side that became the hit – his ONLY hit – cracking Billboard’s Top Ten and with that success his future course was probably set, as if it hadn’t been already, with him destined to return more to the blues. Too bad though, because on THIS side, Shout Baby Shout, L.C. Williams showed that he was born to rock and by the sound of it there was no reason to believe he’d ever done anything BUT rock from the moment he entered this world. Where to start with this? Take your pick because everywhere you look there’s something to catch your attention. But we’ll start with Williams himself, which is only fair I suppose since it’s his record, but it’s also the most notable aspect of the record provided you’re aware of his earlier sides in another style. Obviously he’s had to change his approach considerably to fit comfortably into the rock parameters and we’ll get to the rousing accompaniment and the song’s more boisterous content soon enough. But even were all of that present Shout Baby Shout still might not make the grade here if not for the complete and utter transformation of the man in the center of the studio. In his first two rock sides he was reasonably playing the part he was called upon to deliver. The first, I Don’t Want Your Baby, he was in ballad territory which he did well but doesn’t give much insight into how he’d handle the more unhinged aspects of uptempo rock. On his follow up, That’s Alright, he skirted the edge of that approach without giving himself over to its impulses entirely. But now for the first time he holds absolutely nothing back and the results are relavatory. This is Williams is acting his age for a change. He’s rambunctious in a way that teenagers seem to hold a patent for, impatient in his demands and confident in the reply he’s sure to get. He nails the attitude part of the equation in no uncertain terms. But what stands out is how effortlessly his vocal chords are cooperating with this assignment. In short he sounds like a totally different person. Decades have been shaved from his larynx it seems. His tone has changed, his inflections are completely altered and he sounds completely natural in delivering a song this way. It is easily the most striking change we’ve witnessed from any artist, not just in rock to date, but arguably in any music you’ve heard. If it was Bing Crosby singing this the same way that Williams does here you might not be any more shocked. Yet Williams’s voice is perfect for the job. He starts off in high gear, his voice a lean tenor whine, stomping the gas and never letting up. Lyrics are absolutely meaningless other than to set the mood which combines exuberant horniness and a restless impatience and uses that as nitro fuel for the entire ride. But this wasn’t the FIRST time Williams had sung this. In what would be a somewhat common occurrence for this day and age among independent labels and yet to be established singers, Williams had cut an earlier version under the auspices of pianist Connie McBooker on Eddie’s Records, its title then being Short Baby Boogie. 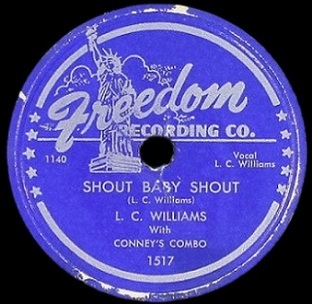 That was a misprint however because Williams is clearly singing “Shout”. In fact he’s singing the same lyrics as this, albeit a little rougher and thereby sounding slightly older, even though he was younger when he recorded this a few months earlier. Regular readers here know the story of Eddie’s Records, a local Houston label which was founded the year before with the express purpose to cut another teenage prodigy Little Willie Littlefield but which found the operations of running a company too much to handle and folded. 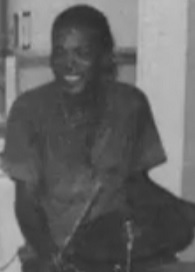 But in the process Eddie encouraged the founders of Freedom Records to launch and even handed over their remaining side on Littlefield with which to launch their operations. Is it any wonder then that Williams also found his way to their company? As good as Williams is here there can be no mistaking that he’s not driving the bus by any means. The backing band is primarily responsible for not just the frantic pace of the song but also the accompanying mood it inhabits. The difference between the Eddie’s Records version of this song and Shout Baby Shout on Freedom Records comes down to the work of Conney’s Combo, which was simply our friends The Hep-Cats, the label’s nonpareil studio band, under a flimsy alias. Led by Conrad Johnson on alto sax, the regular crew consisting of Lonnie Lyons on piano, Sam Williams on tenor, Alison Tucker on drums, Nelson Mills on trumpet and Nunu Pitts holding down the bass, they had no equals in rock at this point when it came to self-contained hell-raisers and as always results on this one are supercharged. Their job is to barrel along at a breakneck pace and yet still somehow keep this on track. It starts off modestly enough with Lyons playing a simple introduction with his right hand before his left jumps in to lay down the rhythm as Williams comes along. They work well in tandem but when L. C. bows out for the first instrumental break Lyons takes over, his piano pounding not quite as violent as what would come to be seen as normal a decade down the road, but it’s still invigorating. The second break features Conrad Johnson taking center stage for a rare alto sax showcase. He wanders about melodically a bit and with the higher tone of his horn it becomes more noticeable than if it were Sam Williams tenor instead, but he’s keeping everything moving along at a steady clip. Basically the musical track – simple though it may be – is the prototype for a thousand and one rock songs that would be made over the next decade. In the fact you could argue that Shout Baby Shout is the first car rolled off the assembly line for this model of rock ‘n’ roll which would soon become ubiquitous in the 1950’s. There’s a balancing act that rock music has long kept up which tempers the ambitious experimentation of certain artists with the more rudimentary work of others. While on their surface they seem to be complete opposites and therefore unlikely that they’d share residency in one musical genre the fact of the matter is they act as the yin and the yang of the style to prevent rock from focusing too much of one side of the equation. On songs like this there’s admittedly not much complexity to delve into, the lyrics are simple and repetitive, the musical accompaniment is rousing but direct and without variance, they’re aiming for a basic primal response rather than a deeper emotional connection. Yet they succeed admirably in those rather limited goals and as a result the record not only gives L.C Williams the rock identity he needed but it further establishes The Hep Cats (or however you feel like referring to them) as the prime proponents of the storming barn-burner approach in rock. More importantly in the big picture scheme of things Shout Baby Shout shows the inherent value in turning skilled artists and musicians loose in the studio and telling them to do their best to excite an audience. If rock ‘n’ roll had a manifesto it wouldn’t need to be much more complicated than that basic credo. Leave a reply on "L. C. Williams: “Shout Baby Shout”"